From critically acclaimed and award-winning writer, Russell Wangersky, comes a new collection of short fiction. Everyone has something they’re good at: one particular personal skill that they use to keep their lives moving forward when their worlds suddenly become difficult or near-impossible. For some, it’s denial; for others, blunt pragmatism. Still others depend on an over-inflated view of self to keep criticism and doubt at bay. 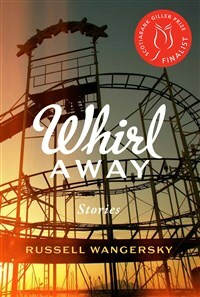 In his new short story collection, Whirl Away, Russell Wangersky—author of critically-acclaimed fiction and non-fiction including The Glass Harmonica, Burning Down the House: Fighting Fires and Losing Myself and The Hour of Bad Decisions— looks at what happens when people’s personal coping skills go awry. These are people who discover their anchor-chain has broken: characters safe in the world of self-deception or even selfdelusion, forced to face the fact that their main line of defense has become their greatest weakness. From the caretaker of a prairie amusement park to the lone occupant of a collapsing Newfoundland town, from a travelling sports drink marketer with a pressing need to get off the road to an elevator inspector who finds himself losing his marriage while sensuously burying himself in the tastes and smells of the kitchen, these are people who spin wildly out of control, finding themselves in a new and different world. Russell Wangersky's most recent book, The Glass Harmonica, won the 2010 BMO Winterset Award and was longlisted for the Relit Awards. His previous book, Burning Down the House: Fighting Fires and Losing Myself won Canada's largest non-fiction prize, the British Columbia National Award for Canadian Non-Fiction, the Rogers Communications Newfoundland and Labrador Non-Fiction Book Award and the Edna Staebler Award for Creative Non-Fiction. It was also a finalist for the Writer's Trust Non-Fiction Prize and was a Globe and Mail Top 100 selection in 2008. His 2006 short story collection The Hour of Bad Decisions was long-listed for the Scotiabank Giller Prize, and was shortlisted for the Commonwealth Writer's Prize, first book, Canada and the Caribbean. It was a Globe and Mail Top 100 selection in 2006. Wangersky lives and works in St. John's, where he is an editor and columnist with the St. John's Telegram.